Leggett & Platt Adjustable Bed Owners Manuals – Premium Models and Performance Models – Prodigy 2.0, Premier, Performance Models S-Cape+, S-Cape, Simplicity, Signature, Pro-Motion, Vibrance. 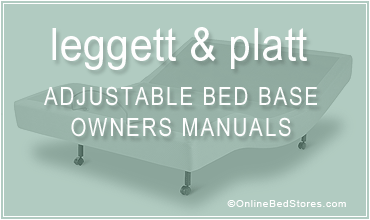 Leggett & Platt® has been a premier provider of adjustable bed bases for over 40 years. Leggett & Platt® Adjustable Bases Group (ABG) has been a premier provider of adjustable bed bases for over 40 years. L&P adjustable bed bases offer a host of innovative features. You can find Leggett & Platt® Adjustable Bases in retail furniture stores, department stores, and bedding stores across the country, as well as online. OnlineBedStores.com (OBS) Recommends that you choose an online retailer that is knowledgeable and has experience with L&P adjustable beds. This is a category where you should stay clear of large online marketplaces that may not be able to answer your questions intelligently. Remember the lowest price could very well end up costing you the most.